cPanel email forwarding copies incoming email at one address to a second email address. An example is when you have an email sent to joe@blogs.com, but you want to copy it automatically to your primary email account iamjoe@blogs.com. You may have multiple email addresses, but want them forwarded to the one email address you check regularly. You may have used free email services in the past like Hotmail or Gmail, but now don’t use them. You can forward any residual emails to your new email address. You may want to forward all your business emails to a colleague when you are away on holiday. This is especially useful when used in combination with a cPanel Autoresponder. 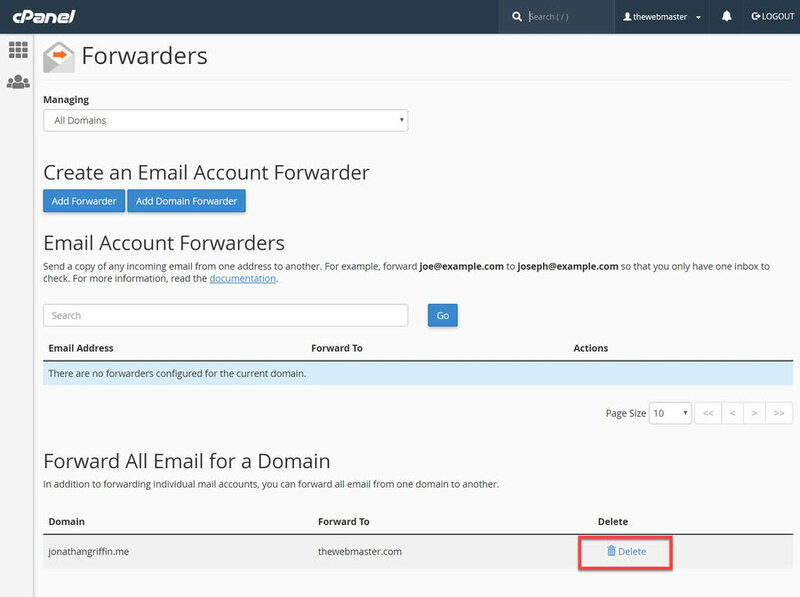 When configuring your email forwarder, you can either forward all email for your domain or forward all email for a particular email address. 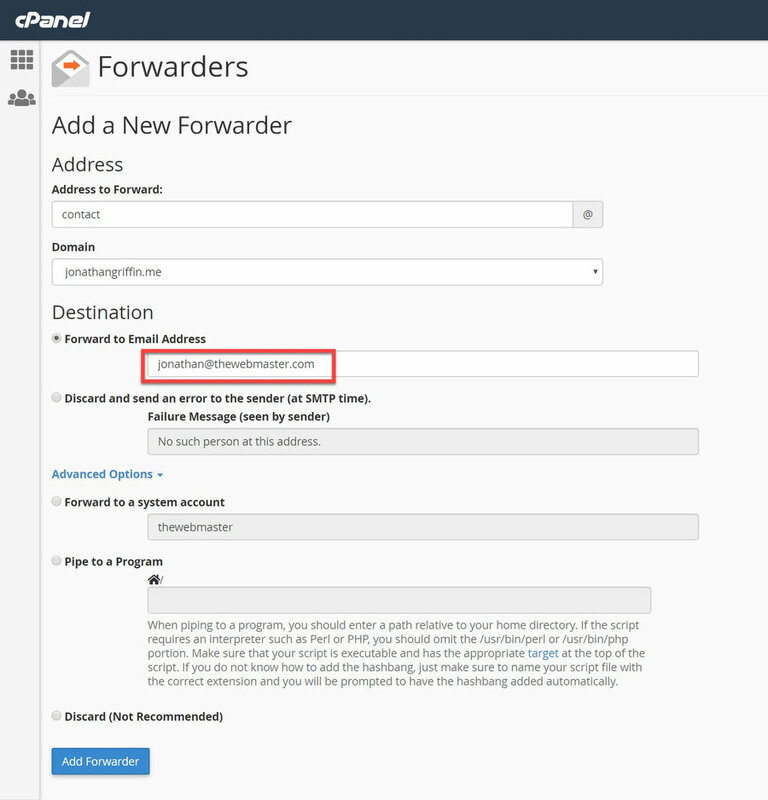 You can add multiple forwarders for a domain to cover multiple addresses should you wish. 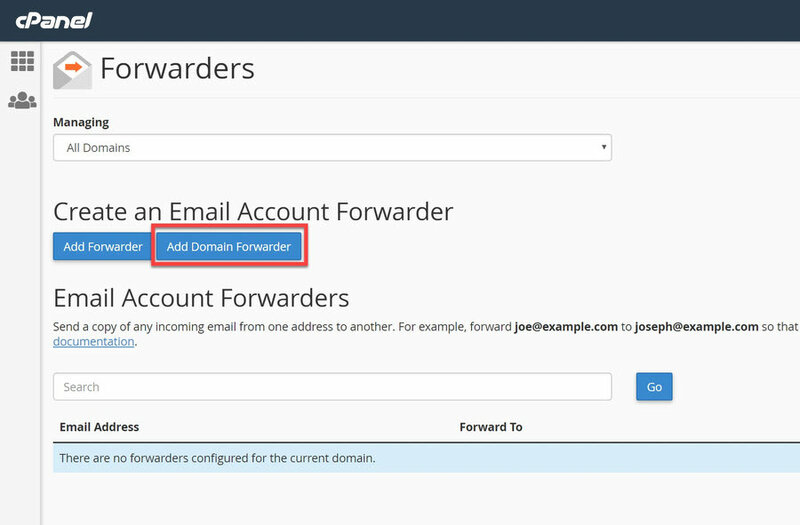 This tutorial will show you how to set up an Email Forwarder for all email accounts on the domain, including the default catch-all address. Unfortunately, you cannot forward the messages to a specific email address. Instead, the emails are forwarded to the default email address, otherwise known as a catch-all email address. You can find out how to configure the default address here. Click on the Forwarders icon on the cPanel dashboard. Click on the Forwarders icon © The Webmaster. Click ‘Add Domain Forwarder’ to go to the configuration screen. Click 'Add Domain Forwarder' © The Webmaster. Enter the domain where all the emails should be forwarded. As I mentioned above, you can only enter a domain, not a specific email address. You will need to ensure you have a default email address configured at the domain you wish to forward emails. Enter the domain where the emails should be forwarded. Enter the domain where all the emails should be forwarded. © The Webmaster. 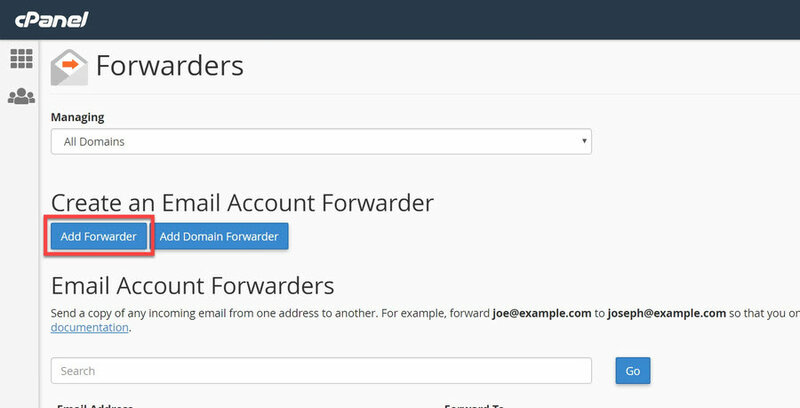 To create email forwarders for specific or multiple email addresses is similarly straightforward. Click the ‘Add Forwarder’ button to go to the configuration screen. Click on the 'Add Forwarder' button © The Webmaster. Add the email address you wish to forward from © The Webmaster. In the “Forward to Email Address” box, enter the forwarding email address. Click “Add Forwarder” at the bottom of the page to save your changes. Discard with error to sender (at SMTP time) — If you wish to discard all incoming email sent to that account, you can do so by selecting this option instead. You can also enter a delivery failure message in the text box, which will be seen by the sender. Advanced Options — Here you can choose to forward the email to a system account instead, pipe the email to a program (this is commonly used when integrating with third-party support programs for ticketing), or just discard. Enter the Destination Address © The Webmaster. You can delete a forwarder at any time for a mail account. Unfortunately, you are not able to change an existing forwarder, or temporarily disable it. If you wish to change or stop a forwarder, it must be deleted. You can then recreate it as required. Click Delete next to the forwarder you wish to delete. Click “Delete Forwarder” or “Delete Domain Forwarder” (depending on the type you are deleting) to confirm.